to be honoured with the Country's Highest Civilian Award posthumously. 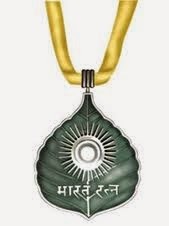 To set the curtains down on the controversy of who needs to be conferred Bharat Ratna, it is time for the country to prepare a shortlist of all contenders and bring consensus among the political class and civil society and confer the Bharat Ratna with a single stroke as hanging the issue for prolonged time will only create more ripples and heartburn among certain sections of the society. When such exercise is started, no doubt that Ghalib is front runner for this covetous award !